This audiobook was really hard to listen to, because of its incomprehensible facts, but I'm glad I did. You can't feel good while listening to this but you can learn many things about the Holocaust which is why I set out listening to this dreary audiobook. It all started when I watched the movie Shindler's List, a well-made movie that affected me deeply. I just didn't understand how such atrocities could have occurred. Sure Hitler may have believed that all Jews needed to be exterminated but how did a national army get the point where they were carrying out mass murder on a level unseen by history? I wanted to understand, so I downloaded this audiobook. I now have much more of an understanding of how everything went down, but it is still baffling and depressing to me to think on The Holocaust. The author and narrator of the lectures which make up this audiobook is extremely knowledgeable and speaks superbly. The audio quality is top notch and even though I think he's reading from a script, simply because he doesn't have a bunch of ums and ahs in there, it really seems like he's just drawing from the massive amounts of knowledge he has in his brain. It really sounds like you're sitting in on one amazing lecture after another. 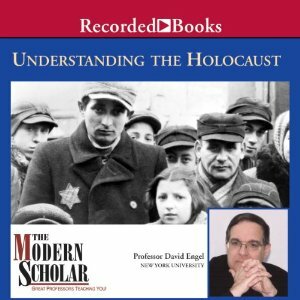 If you've ever wanted to understand the Holocaust, this audiobook lives up to its title. It won't be an easy listen, but it will answer many questions I'm sure you have, and maybe even some you didn't realize you had. What books have you read on The Holocaust that have been meaningful or insightful to you? I'm planning on reading Anne Frank: The Diary of a Young Girl soon. I've owned the paperback for years. I think it's time to read it. Thanks for stopping by!